Inea – a cable television operator offering telecommunications services to over 200,000 inhabitants of the Wielkopolska province (Poland). The operator offers digital (SD and HD) and analogue television, fixed and mobile Internet access, and also fixed and mobile telephony. INEA Online TV is an app running in a multiscreen service to enable the broadcast of television programmes online, on computers and mobile devices, regardless of the time and place. Inea Online TV is one of the first implementations of a multiscreen service by TV operators in Poland. INEA subscribers can watch selected programmes outside the home – on the website or via an app for phones and tablets. The base feature implemented in INEA Online TV is EPG (electronic programme guide) – a list of channels offered by INEA together with their broadcast schedule. The currently transmitted programmes are separated visually to make it easier for users to navigate and utilise this view. 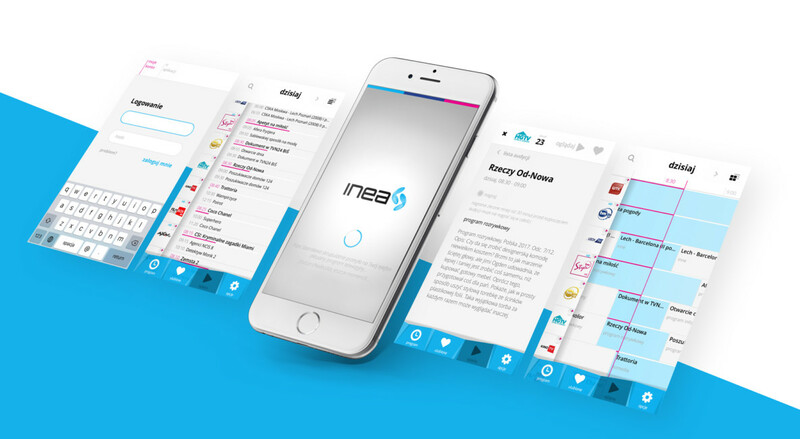 Users who are not subscribers of INEA can only benefit from the basic version of the app, meaning the ability to browse the EPG. There are many more features for subscribers who sign in to the app. First of all, they are given the opportunity to watch over 60 TV channels on their mobile device within the INEA range. Furthermore, the app allows you to create a list of favourite programmes, as well as to set and receive notifications about important episodes or games on your smartphone. Subscribers who sign in can also use INEA Online TV to remotely record a film or series to their decoder, and then watch it at a convenient time on TV at home.